Today is the day after our summer in California. In California we stay at my parents' house, and if you've followed this blog long enough, you know that my mother is the original food pusher in my life. She loves to stock her house with yummy things that she knows we all love, like chips, and sourdough bread, and ice cream Drumsticks, and Dove Chocolate. Okay, maybe I was the one to buy the Dove chocolate when I got there. I was also the one baking and cooking daily to fatten my family up. At any rate, I decided to turn over a new leaf when I got back home. I was doing great until about 1:30, when I got really hungry. But before 1:30, around 10:00, I had this for breakfast. 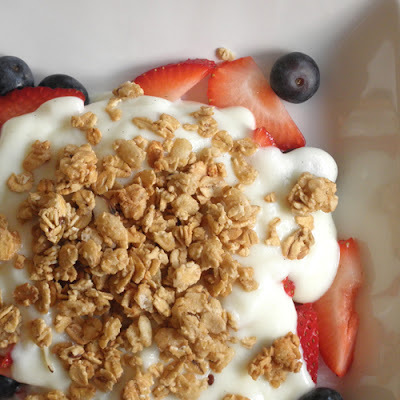 It is inspired by both my Star Spangled Cheesecake and McDonald's Fruit and Yogurt Parfait. 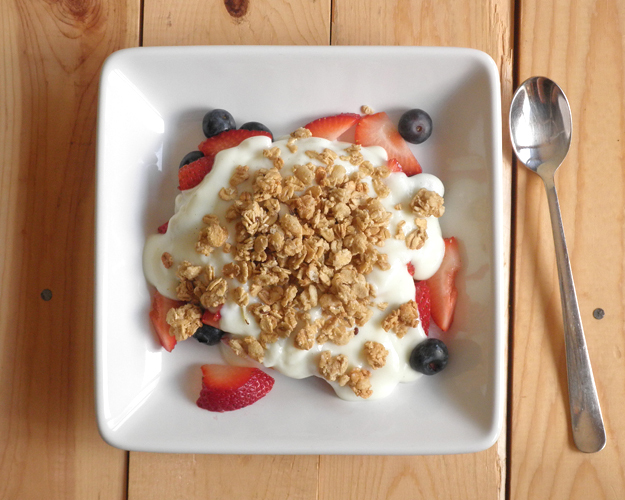 I've loved the parfait for a long time, and I knew it was simple--just vanilla yogurt, strawberries, blueberries, and granola. As for the cheesecake, it was the first time I've actually paired fresh fruit with this type of cheesecake, and I loved it so much that I kept wanting to make it while in California. I never got around to it, and now that I'm turning over my new leaf (sort of), I need to put that notion away. This dish here is my happy solution to my craving. Rinse berries under cold water and place on a clean paper towel. Pat berries dry, cut strawberries into bite-size pieces, and place berries in a cereal bowl. 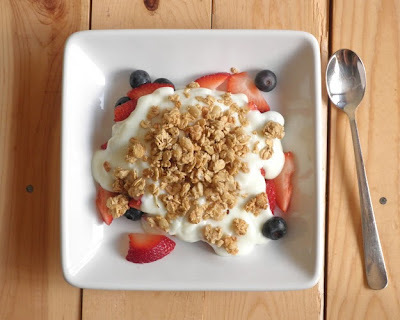 Scoop the yogurt over the berries and then top with the granola.